Promoting at your event can be a complicated process, but it doesn’t have to be. What you need is an event promotion supply company that you can trust to help ensure you get the best gear for your event needs. From creating a themed display, custom printed tents, or custom printed inflatable furniture, you surely want the best to promote your product, service, and organization. STRIKE Visuals is the number one company that understands your demands when it comes to promoting your activities through various marketing techniques. The world today is evidently buyer-empowered. Businesses need to seize all opportunities in building relationships and gaining the trust of buyers and prospective clients. Modern customers these days want more than just a pitch in making purchasing choices and evaluating solutions. It is why organizations turn to events, which provide them with the chance to interact with customers and see how they interact with brands. Your event will allow people to get a firsthand sense of the perspective, focus, and personality of your company. Having a strong brand presence is an integral part of your strategy and demand generation as well to help boost your business’s bottom line. STRIKE recognizes how highly competitive the business environment has become in just a few years. No matter what industry you are in, you will benefit from event promotion supplies. STRIKE offers products, from tents to archers to banners, which you can use to make a strong impression at your event. Here are some tips to get the most out of your events! STRIKE Visuals is all about providing the highest quality equipment for your important event at the best price available. Whether you need tents, canopies, inflatable archways, or promotional banners, you can find whatever you will be useful for your event. Treat others fairly. In the real world, relationships matter, especially in businesses. STRIKE believes that respect for others and treating them with understanding and consideration will help the team prosper, and the company as well. Enjoy life! Life is short, which is why STRIKE chooses to do things that bring everyone joy, whether it is the staff or the customers. Never give up. STRIKE is relentless and will never be satisfied with the current results of the business. It is because what matters is the future, which is why the team always searches for new ways on how to improve the services and products. Take risks. There is a saying that risk takers are winners. STRIKE believes that a successful company is ready to embrace and take risks. After all, running a business involves lots of risk-taking. STRIKE makes sure that these opportunities are calculated not just random gambles. Solutions. It does not matter what the task is, whether it is big or small, STRIKE is your go-to event supply that gets everything done. There is no secret in becoming the go-to guy in supplying events equipment and other products. The company guarantees to deliver on its promises – each and every one of them – consistently. Above all, STRIKE aims to build a stellar company whose purpose is to enrich and elevate people’s lives. STRIKE Visuals has the positive attitude you need to help you find the most suitable goods for your upcoming event. We offer all products at the best price while making sure that the needs of your business are met, especially with regard to time frames. Why Choose STRIKE as Your Event Promotion Supply Company? The right event promotion supplier for your next business affair plays a huge part in its success. STRIKE Visuals is known to provide the best products at the best possible price. Whether you have an established organization or you are just starting out, STRIKE is your most affordable option. The company is focused on helping you manage your finances by being a competitively priced supplier for all your event needs. Aside from affordability, STRIKE is an organization you can count on. Reliability is a trait that you should always look for when dealing with another business. When it comes to the events promotion supplier that you should choose, it is significant that the company can deliver the right goods you have described on time. STRIKE offers the only lifetime warranty in the industry. STRIKE Visuals proudly offers lifetime warranties on every product you see on the website. If you have any issues with the item that you have purchased, STRIKE can provide a replacement part to fix the problem. The company may also repair the item for you or simply replace it depending on the situation. Most of the time, STRIKE will request for a few photos of the damaged item so that the repair team can properly assess the issue. At this point, it will typically be possible to provide the appropriate warranty service for the product. The process is quite easy and hassle-free. Although you will have to pay for the shipping costs, all replacement parts, and repair services will be provided at absolutely no costs. For more information about the warranties, you can send an email to warranty@strikenow.com. STRIKE has exceptional customer support to assist you in finding the correct product for your upcoming event. There is always someone present in the office that is enthusiastic about providing help for all customers. The phone line is open to giving answers to inquiries and other concerns. If you cannot reach them through phone, you can opt to send an email instead, which the team checks almost 24 hours per day. With 4.9 stars on Google, the almost perfect score shows that the company has a lot of satisfied customers. STRIKE plans to keep it that way, not just to impress potential customers but also keep the existing ones. It is not a secret that high ratings on Google and anywhere else on the web lead to more orders, which is enough to push the company to do even better. If a customer has a complaint, STRIKE makes sure that it will correct the issue right away. Every opinion matters, which is why the company is always happy to read and listen to what customers have to say regarding the services and the products they purchased. STRIKE will give you the highest quality products and printing services. The company aims to be the best supplier for promoting events. With the reputation of the business on the line, every part of the team guarantees quality and performance to the buyers. All the products that you purchase on the website, such as tents, tablet covers and inflatable pieces of furniture will support the theme of your upcoming event effortlessly. That is because you get to select the ones that you know will represent not just the event but your organization as well. All events will need some sort of printing services. When you contact STRIKE, you are assured that you will receive the printed materials you ordered in the highest quality possible. This way, you can catch the attention of your customers with ease. Plus, they will be compelled to read the printed materials that they see in your event. A high-quality item that STRIKE Visuals has printed for you speaks volumes about your business and your brand. The company will not let you down as you place your trust in it for your crucial event. The company specializes in custom designs and printing services. All customers can take advantage of the free design that STRIKE Visuals provide to help the final product look perfect. Reach out to the design team and you can share your vision about the outcome you want. You can also provide a copy of your business logo, your message, and other details about the design. You will get a free sample before the designers print out the final product. If you have never heard about dye sublimation printing, it is one of the superior methods of printing these days. The printer allows custom graphics to be added to various surfaces, including fabrics, clothing, chairs, and of course, promotional products. STRIKE uses dye sublimation printing to reproduce colorful images flawlessly. The method involves a type of solid ink that will be heated to start the process. Unlike other techniques, such as laser and inkjet printing, it does not scatter liquid ink to stain the surface or page. Instead, it heats up the ink to liquefy it and eventually turn it into gas vapor, which goes to the target surface for printing where it reverts to its solid form. Dye sublimation offers many advantages for your printing needs. It does not rely on the conventional method of printing where colors are laid down as individual dots. Therefore, the printed result will not have these dots even if you look closely. You demand high-quality printing and that is what STRIKE provides for you. The result of every printing task is an image that is realistic and more lifelike. Additionally, this method is longer-lasting, especially when compared to other printing techniques. It is because dye sublimation is more thorough since it infuses the printing material, which is possible with how the ink is applied. Instead of liquid, the ink is applied as a gas, which results in an image that appears to be naturally woven to the surface material. Plus, it is less susceptible to wearing out or becoming deteriorated over time. Since STRIKE Visuals uses dye sublimation when printing out event materials, you can count on the dazzling colors and the crystal clear images that will less likely fade over time. If you are looking for a custom or branded tent that has your brand’s logo or the graphics you want, STRIKE Visuals is the event promotion supply company to go for. The skilled designers that work for STRIKE will let you have the best-looking print for your tent. Aside from the looks, the company guarantees that the tents only use the most resilient weatherproof materials. Everything is printed in full color and dye sublimation printing that resists fading. It is guaranteed; your tent will look amazing! Plus, STRIKE custom printed tents come with a lifetime warranty so you can have your purchased product replaced or fixed in no time – no additional fees at all. Select from a wide variety of options including Lite Tents with 30mm square tube frame and 300D canvas roof – a combination that will leave your brand looking good even when you are on a tight budget. Tents come in five size choices, from 5’ x 5’ to 20’ x 17’. STRIKE is your one-stop shop for all your tent needs, so you can buy LED light kits, multi-tent connector brackets, and cases as well. Whether you have a small or big event, you can benefit from a custom table cover that has your logo on it. These covers allow you to stand out from the crowd. It is time to stop using a boring metal table with a black or white cloth that you can see anywhere else. It always pages to invest a little bit, which is why you should get an attractive logo tablecloth from STRIKE. These personalized covers will make a huge difference even in a simple presentation. One of the biggest benefits of using table covers is that they will not take up space in your trade show or even a business meeting. Still, it is an effective advertising method that will fit your smallest booth. Choose between a stretch and fitted table cover at STRIKE and have it customized for your next event. One of the best and most affordable ways to generate attention during an event is to have customized flags. Even businesses with storefronts in a place with low visibility can benefit from these flags by boosting traffic to their doors. STRIKE can provide you with the design of the flag you want that includes your business name, logo, or a few keywords. Choose from various kits, including teardrop, rectangular, and feather flags of different sizes starting from 7’. You can also opt for single-sided or double-sided printing. Aside from the final flags looking great, lifetime warranties are provided. Plus, you can have the STRIKE designers mock up your flag style without additional charges. STRIKE offers a number of inflatable furniture pieces with options, such as chairs, sofas, ottomans, small tables, and bistro furniture. All these items are customizable, easy to transport, lightweight, and can be set up without any help. Inflatable furniture selections can be used at any event, such as trade shows, sporting events, and more. They mix comfort with a sophisticated design that you will only get from STRIKE. Bring in the attention your brand deserves and even create entertainment that will surely be memorable at any event. Discover new heights of exposure and branding that will definitely leave a long-lasting impression for your product or company. Having customized inflatable furniture can generate an enjoyable ambiance for the people in your event. It will also help you connect with the participants. Watch out for discounts and promotions that are hard to beat when you shop for furniture sets at STRIKE Visuals. STRIKE offers inflatable arch kits, accessories, arches, and podium arches on the website. Your next event should feature these big arches if you truly want to create that “wow” factor. They will never go unnoticed, especially if you will use them to welcome your guests. STRIKE makes sure every arch the designers create achieves the maximum visual impact. Whether you have a business event or you need arches for your sporting event, these inflatables will help you promote your brand and product efficiently. STRIKE is the name to trust when it comes to creating a fully branded inflatable arch that can be in a range of shapes and sizes. If you have a vision for the design, simply contact the designers and they will make it happen for you. “The staff is knowledgeable, personable and professional. The tents, banners, feather flags, inflatable arch and table covers we have received are all of the highest quality. The tents, in particular, I am extremely impressed with, durable, rugged and sharp looking. For most races, people expect a couple tents and maybe some sort of finish line banner that was rattled off at the local big box “office store”. Not much to look at, and pretty generic. When they see us all decked out in AES’s finest race materials, on brand, and on point, they are completely blown away. The most common thing I hear when someone comes to one of our events is “WOW, this is amazing. I’ve never seen a more professional looking race”. Whether you need indoor displays, banners, signs, lighting, or even apparel for your upcoming event, STRIKE Visuals is the only event promotion supplier to contact. Start your event with professional designs of inflatables, air dancers, and more and even save time when setting them up. You can find everything you require to make your trade fair or show exciting and unforgettable without worrying about breaking your bank. Promote Your Brand With A Trusted Event Supply Company Like STRIKE Visuals! 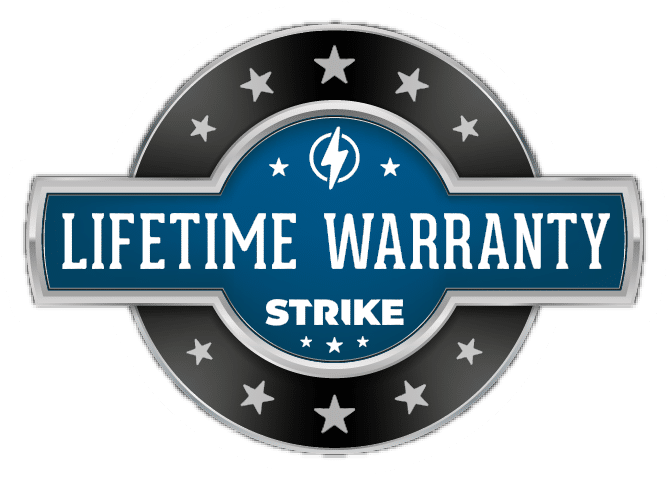 A lifetime warranty comes with all Strike gear! Free design help is offered to make sure you’re confident in the look and quality of your event supplies. Strike offers many options and great customer service to help you find the right product for your needs.